Growing up I was a voracious reader. I loved books of all kinds, from Asterix comics to Agatha Christie mysteries, action-adventure books to Tolkien, CS Lewis, and Roald Dahl. I was a bit more into dwarves and dragons fantasy than sci-fi, though I did love the likes of John Christopher's "The Tripods" series. A couple of years ago, I was blown away by a sci-fi/mystery crossover, the brilliant MADE TO KILL by Adam Christopher; 1960s California noir, just with a robot detective. It was incredibly clever and incredibly fresh, a wonderful story and world. 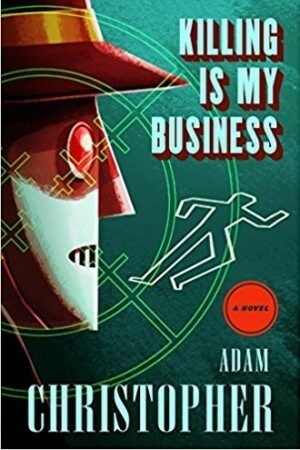 So I went into KILLING IS MY BUSINESS, the second Ray Electromatic novel in a planned LA trilogy, with some pretty high expectations. Maybe that played a part in me feeling post-read like it fell into the 'good' category rather than the 'rave about to everyone' category of the first. Christopher tells another very good tale, and the pages whir and are full of action and intrigue as Ray's latest adventures unfold. But there's a little bit of a 'bridge' feeling, as if things are being set up for a grand finale, perhaps, rather than this being a standalone brilliant book. The Two Towers effect, maybe. There's plenty of energy and life to Christopher's storytelling. He crafts a great sense of the world of his book, a version of 1960s Los Angeles full of the gleaming movie stars, shadowy crooks, and Cold War worries of the time. Ray is an interesting 'hero', a hulking robot with no long-term memory as his tapes are wiped at the end of each day. The latter is an interesting device that sets up lots of possibilities and raises plenty of questions, plot and character-wise. There were occasions in this second novel where it felt a little played out, though perhaps Christopher is setting readers up. Overall, this was a fast, interesting read that perhaps gets a little knocked down more due to the brilliance of its predecessor more than any inherent issues with this tale. Christopher set the bar very high in MADE TO KILL, and maybe he didn't quite vault it this time around. But he's still got another turn to go, and he's shown he's got plenty of 'hops' in his arsenal. I look forward to the finale.